Over the years, roadside attractions come and go. Sometimes they are destroyed, moved, fall into disrepair, or re-purposed. Sometimes the land they are on is privatized or updated for commercial purposes. Either way, it’s always sad to see them go. 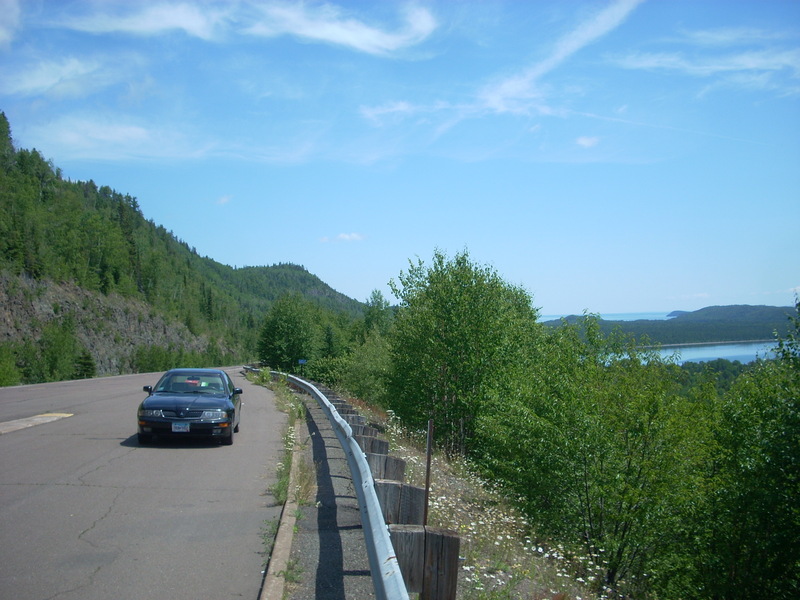 The following list of attractions in Minnesota (and one North Dakota) were photographed in the past 5 years and have suffered an unfortunate fate. But now, their memories can live on! Brainerd, MN used to be home to the Paul Bunyan Land Amusement Center (above). I visited it several times as a youngster, and it was awesome every time. It closed down but was relocated outside of town and reopened in 2003, thankfully. 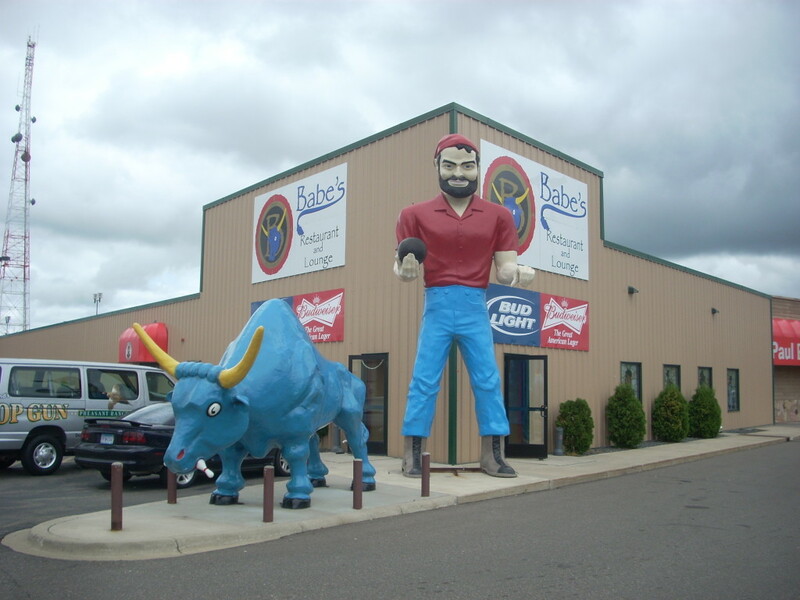 And next to the original location in town, there was a bowling alley which featured a Paul Bunyan Muffler Man and Babe the Blue ox with bowling pins in his mouth (above). Unfortunately, a Kohl’s clothing store now inhabits that space and the statues were shipped off to North Carolina, reportedly. Also located in Brainerd, right downtown by the water tower was another Paul Bunyan and Babe statue. I traveled through Brainerd several times in the last year and it is nowhere to be found. 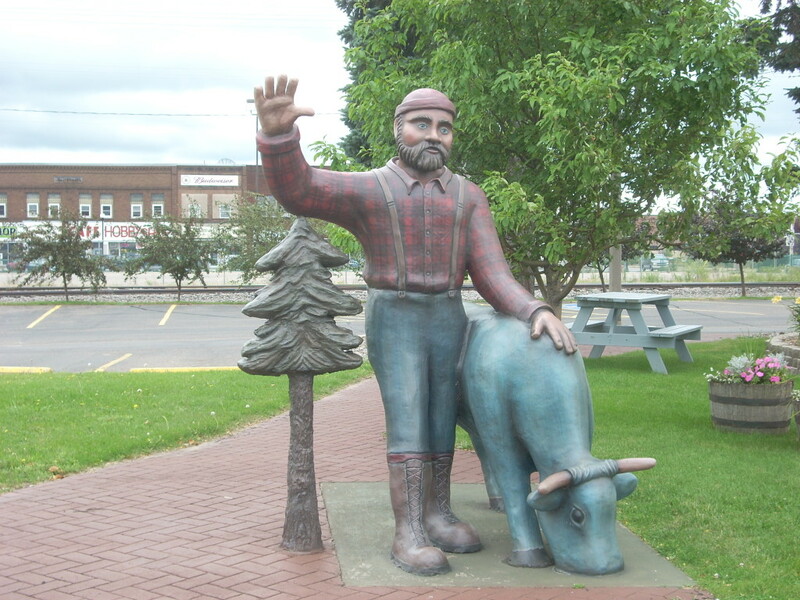 The Brainerd Welcome Center and Chamber of Commerce just south of town features a new Paul Bunyan statue, possibly replacing this iconic statue. I guess we’ll never know. 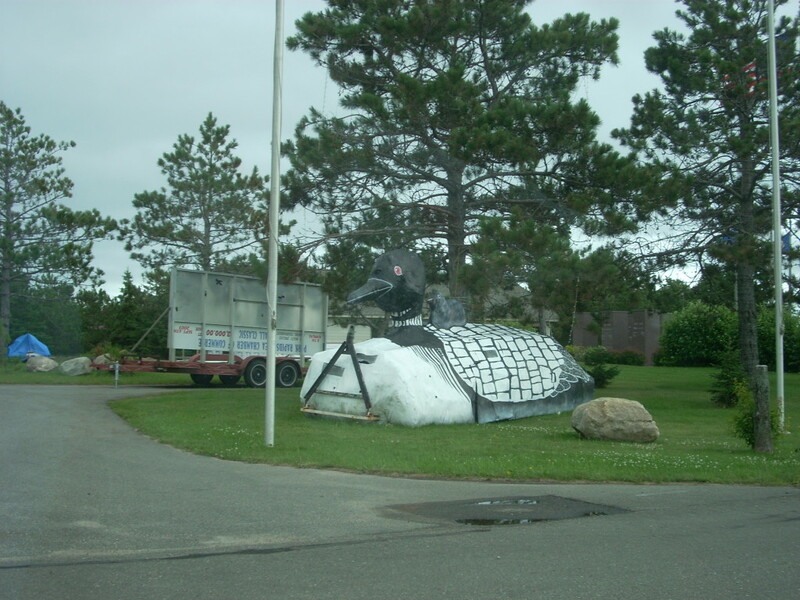 And outside of the Chamber of Commerce in Park Rapids, MN, there used to sit a giant loon on top of a trailer, likely for parade use. While not being paraded around, the loon sat near the highway for a quick photo op. It has since vanished in the past few years. A good guess is that it started to deteriorate. Where it ended up is anyone’s guess. 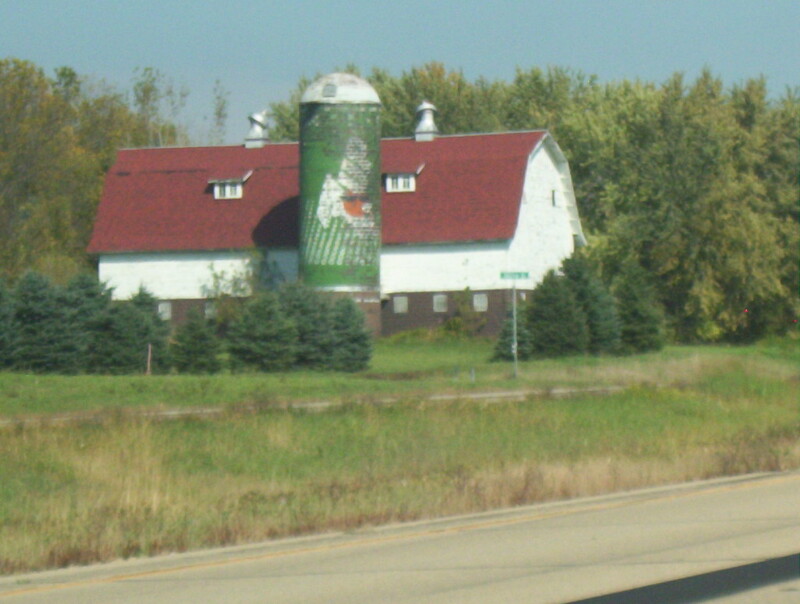 On Highway 169 southwest of Le Seuer, MN, there stands a grain silo attached to a barn on the edge of a bluff along the Minnesota River Valley. It used to feature a ghost sign of a faded, vintage 7UP logo. It was nostalgic and cool and it contrasted great against the red shingling of the adjacent barn. However, in 2009 the silo was “re-branded” with a new paint and new company advertisement, Cambria, a granite countertop manufacturer in nearby Jordan. It’s now black, and the barn got an update as well. 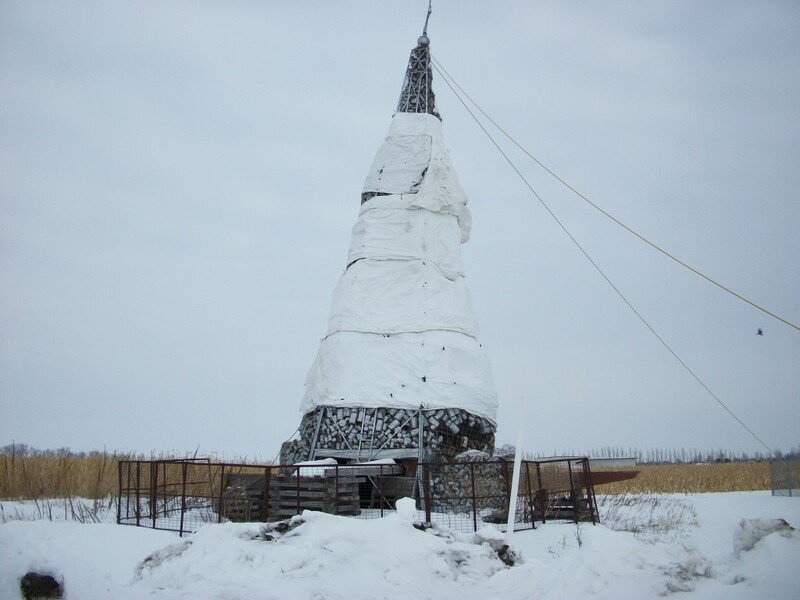 In the interstate town of Casselton, ND, just west of Fargo, a giant collection of used oil cans once towered. This conical shaped structure became so large it had to be held together with chicken wire and mats to prevent animals from nesting in it. It served no purpose and not much explanation of it was available. It was just… there. Eventually the 45-ft tall structure was dismantled and shipped off to God-knows-where. The town didn’t want to spend the money to move it, and it will likely never be seen again. And then there was the tiny village of Tenney, MN, population 5. I passed through back in 2009, and at the time, this was the smallest incorporated city in the United States. It wasn’t much more than a few houses, a couple abandoned buildings, and a grain elevator along a railroad line. As of 2011, Tenney residents voted 2-1 to dissolve the town. I would imagine the sign will stay, but it’s status as an actual town is nothing but a memory. The Ak-Sar-Ben Rock Garden used to be a majestic place. Built by two brothers from Nebraska (the garden’s name is Nebraska backwards) on the grounds of their summer lake home on Tame Fish Lake near Deerwood, MN, the rock garden spanned acres with countless rock structures such as a sundial, a grotto, a wishing well, a miniature, castle, pools, and other whimsical pieces. 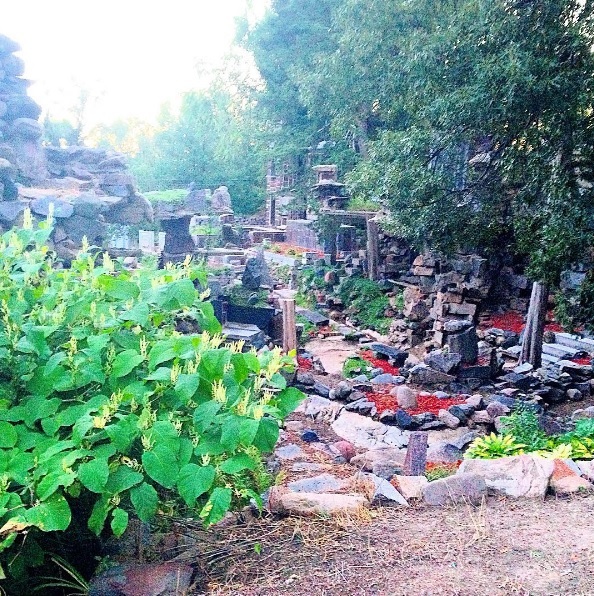 The fabled gardens used to host Hollywood celebrities like Will Rogers and Norma Talmadge. In 1939, 40,000 people came to see the garden. Nowadays the garden is mostly disassembled and the few remaining items are now on private property, hardly visible from the road. The H.P. 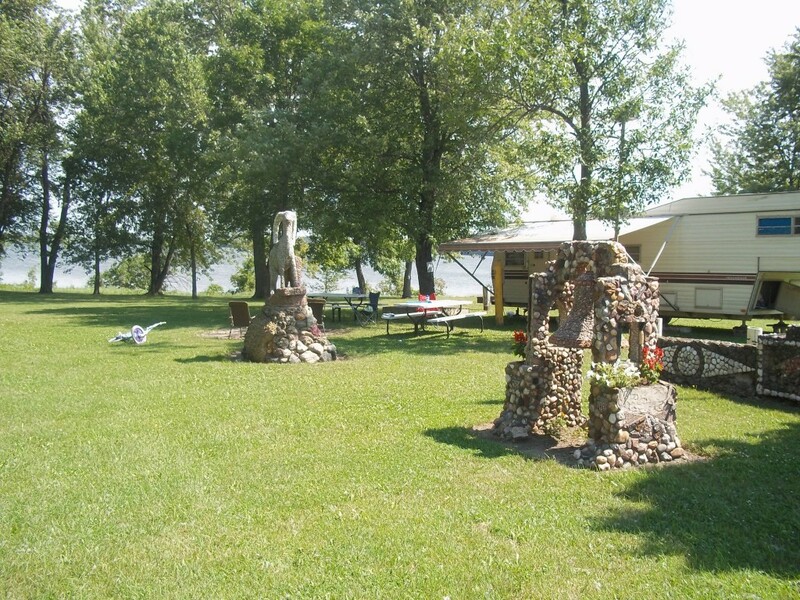 Pederson site in tiny Arco, MN is another curious former roadside attraction. 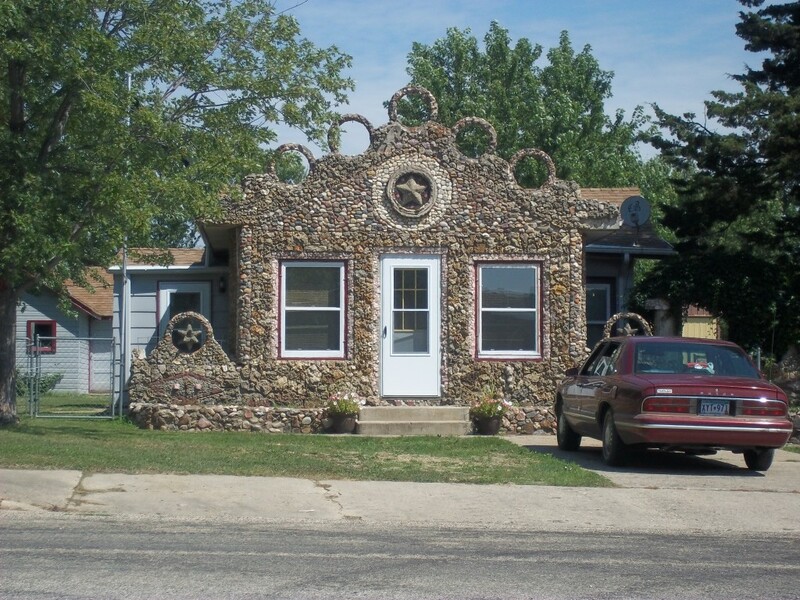 The original owner bought a Texaco station in 1936 and adorned it with rocks he removed from nearby farmed fields. But he didn’t stop there. He went on to create numerous rock scultpures such as a Statue of Liberty, a Liberty Bell, a windmill, and dozens of other figures. Tourists would come from miles to see this remarkable place, and it is said that in 1949, 4,000 visitors from around the nation stopped by to see it. Well, those days are gone. The gas station has been converted to a private home residence, and only a handful of the structures remain, relocated to a campground just outside of town (below). 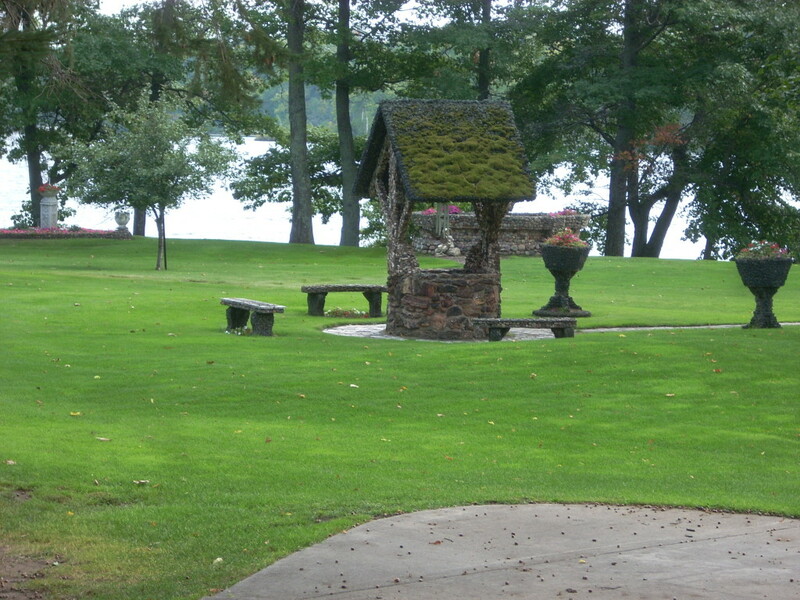 And another similar tale is the Molehill Rock Garden in Sauk Rapids, MN. Built on a private residence by Louis Wippich between the years of 1949-1973, it featured columns, underground chambers, a lily pond, the 45-ft tower (below), a miniature Greek Temple, and all kinds of other structures. After the creator’s passing, the beloved site fell into serious disrepair. It is my understanding that the current owners have spruced it up a little, and who knows, maybe down the road it will be restored to its former glory. 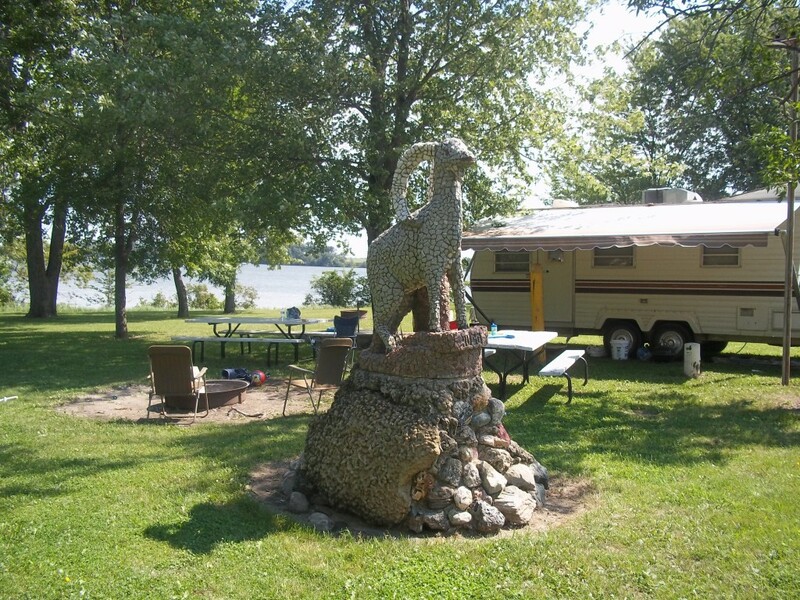 There are several other examples of once-glorious rock gardens in MN, such as the Itasca Rock Garden in Albert Lea, MN, or Johnson’s Rock Garden in Hendricks, MN. While closed to the public, remnants of these once-glorious places are often visible from the street. The last tale of a forgotten roadside oddity is found in St Paul, MN. The remains of “Billy Dunn’s Playground,” from the 1960’s, has also fallen into urban decay. The history behind it is that what was once a service station, saw a tragic accident back in 1963 where the owner’s grandson was killed by a fueling truck backing up. His Grandpa bought up all sorts of roadside attractions as a memorial of sorts. The history is unclear, and research shows many random structures here once, such as artifacts from a mini golf course. 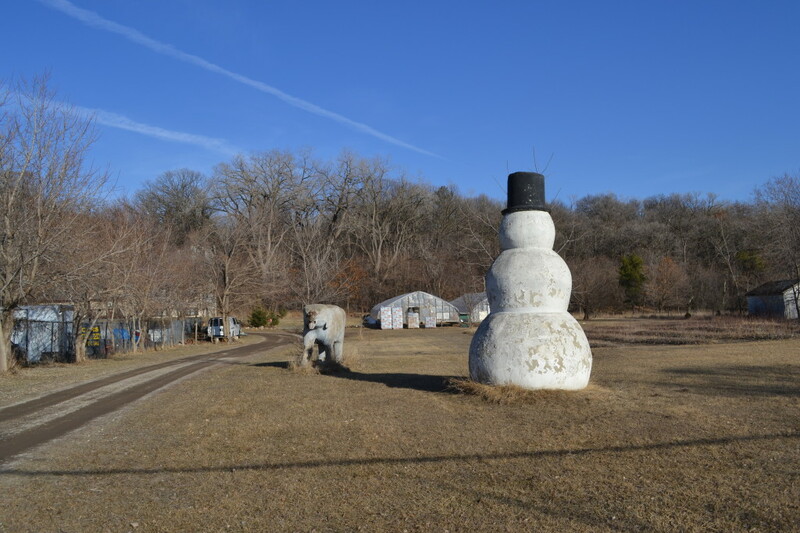 Now, only a snowman, a busted up elephant, and an old wishing well are all that remain. Their fate is uncertain. While it’s always sad to see a roadside attraction go, I guess one can take solace in knowing that there is often a new one that will pop up down the road. And while photos do a good job of preserving the once iconic photos, sometimes there just no substitute for getting out there and seeing them for yourself.